Service Dog vs Emotional Support Dog vs Therapy Dog – ComeHereBoy! It’s easy to be a bit confused about the words we use for the dogs that help us. Often, when people are first looking into a service dog, they will use the wrong words for talking about what they’re looking for. This makes it hard for them to find the proper help they need. Let’s talk about the different types of helper dogs and what they’re used for. A service dog is a dog that is prescribed by a doctor to help somebody who has a disability by performing a task. They are trained to behave perfectly in public as well as being trained to preform at least one task. A task is “work” the dog has been trained to perform to help mitigate (mitigate means “make less severe, serious, or painful”) the disability. So a dog that has been trained to help guide a blind person around is a service dog. A dog that has been trained to alert to a seizure, so the person can lay down in a safe place, is a service animal. But it’s not only visible disabilities that count! What we call “invisible” disabilities count too. Invisible disabilities are disabilities that aren’t apparent just by looking at someone. A dog that has been trained to alert to an anxiety attack, so the owner can take medicine or otherwise make it safe for themselves, is also performing a task and is a service dog. A dog that is trained to press on your chest (deep pressure therapy) when asked, to help you stop feeling so depressed you are considering harming yourself, is performing a task and is a service dog. A dog that is trained to provide grounding by licking your face to bring you out of severe depersonalization caused by severe depression is performing a task and is a service dog. 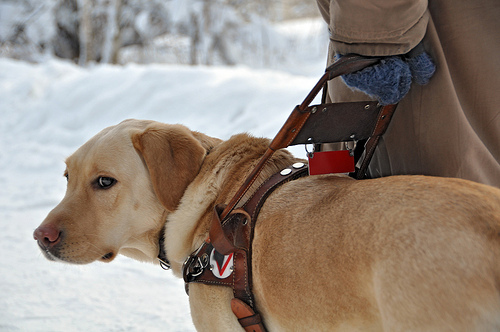 Service dogs, when accompanying their disabled owner, have “access rights”. This means they can go with their owner into any place the general public is allowed to go, with very few exceptions. They are allowed on planes and in any housing that is subject to the Fair Housing Act. Service dogs are basically medical equipment, like an oxygen tank or a wheelchair. To sum it up, a service dog is for people with disabilities. It has been trained to be in public. It has been trained to perform a task to help the disability. It can access any place the public can go as long as it accompanies its disabled handler. If you are interested in learning more about service dogs, sign up for my newsletter. Get free updates when we write about service dogs. Emotional support dogs are for people with issues that might or might not be disabilities. They don’t need to be trained for going in public. They don’t need to be trained to do anything specific for the person who owns them. Emotional support dogs are prescribed by a doctor. Emotional support dogs are dogs that are just there to make a person who has an issue feel better. So, if you have depression and sometimes you feel sad or emotionless and you pet your dog and you feel better, this is an emotional support dog. If you have PTSD and having a dog around the house makes you feel less anxious about something happening to you, this is an emotional support dog. If you have anxiety attacks and you pet the dog and it makes you feel better or grounds you, this is an emotional support dog. Basically, an emotional support dog just exists in your life and hasn’t been trained to make you feel better by doing something itself. Emotional support dogs generally don’t have access rights. This means that they cannot go into public areas with you, other than ones where all pets are allowed. There are a few exceptions of local cities that have laws that allow emotional support dogs in public places, but most cities/localities do not allow them. They are sometimes allowed on airplanes. They are allowed in any housing that is subject to the Fair Housing Act. To sum it up, emotional support dogs are for any person with an issue that causes emotional trouble. They can be for someone considered disabled, but are also for people who are not disabled. They are not trained to do anything specific, they make you feel better by being near you. They do not have access to public areas, but have housing rights. Therapy dogs are dogs that are not prescribed by a doctor. They are trained to behave very well. They help people other than their owner. 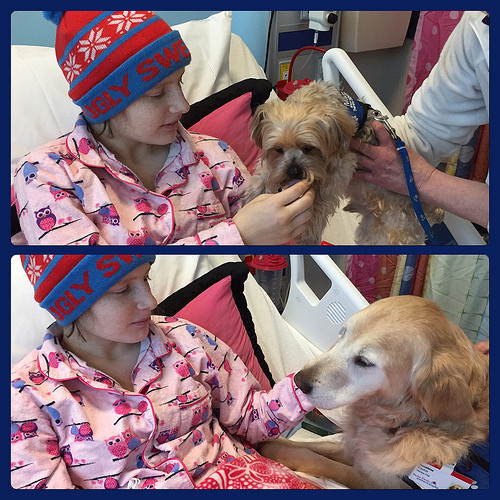 Therapy dogs are dogs that visit places to help cheer people up or feel better. They often go to hospitals and old folk’s homes, but sometimes visit other places like camps for kids with disabilities. Sometimes psychologists may use them during therapy sessions to help a person feel more comfortable, keep calm, or feel better. Therapy dog owners have to ask permission to go to the places that they go to. They don’t have public access rights. However, therapy dogs are trained to behave perfectly in public. They have to have very good manners and love all people. They may be trained to perform tricks for amusement or trained to lick, jump up or cuddle when invited to by the person they are visiting. Usually, therapy dogs and their owners are members of a therapy dog organization, such as Therapy Dogs International. These organizations require the dogs to pass a test before they join and they have to follow the rules of the organization. To sum up therapy dogs, they are dogs that are not prescribed by a doctor. They help other people feel better that are not their owner. They are trained to behave well in public, but they do not have an public access rights and can only go places they have been invited. Do you have a disability (physical or mental) that a dog can be trained to help? Then you are looking for a service dog. 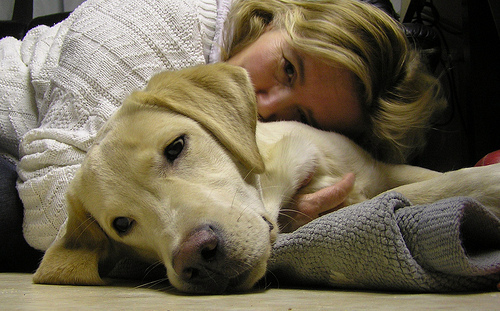 Do you have a health issue that causes emotional distress and a dog helps you feel better? Then you are looking for an emotional support dog. Do you want to help other people by taking a well-behaved dog to visit them and make them feel better? Then you are looking for a therapy dog. You can find the right dog to help you! Hopefully this little summary can help you find the right resources. hi. i found this article by fb and i’d like to correct you on something. Dogs for PTSD are SERVICE DOGS. not esa or therapy dogs. the only way they are esa is you got the dog to hug at home. but most PTSD dogs are labeled by the ADA as SERVICE DOGS. If the dog is in the home and just makes someone with PTSD feel safer, but hasn’t been trained to actually perform a task for someone with PTSD (like retrieve medication, ground when a flashback occurs, etc), then it’s an ESA. Both ESAs and PSDs are for people with disabilities (like PTSD), the difference is whether the dog has been trained to do something to help with the PTSD or not. PSDs have been trained in a task that helps someone feel better, ESAs are not trained in a task – just their presence is enough to make someone feel better. I am only 16 and I habe went through so much in my life and would have a trained dog to help when anxiety attacks happens and depressionso that the dog would already know what to do. I have when through see my grandmother pass in front of me and my father being found dead. After my father passed my anxiety attacks has gotten even worse. So I came on this sight today to see if there was a way to get an assigned dog that is trained and ready to help those in need. If a person has seizures and petting their dog makes them feel better in the moment, that isn’t a service dog. If it isn’t trained to alert the seizures before hand, or do anythin linked to the illness, then it isn’t doing a task, it would only be giving emotional support. Careful not to get confused with disabilities + dog. What the dogs can do for the handlers determine if they are for emotional support, service work, or therapy. I agree with Christina. It doesn’t matter WHAT disability the person has, it depends on what the dog actually DOES. Emotional support isn’t service work, even if you have an illness, invisible or visible. It can get quite confusing sometimes, but this post really cleared it up perfectly.